아주 자동차를 찾아주신 고객 여러분께 진심으로 감사드립니다. 아주 자동차는 오랜 경험을 바탕으로 엄선된 중고차만을 보유하고 있습니다. 최고의 “ Specail Lease & New “ 를 정성껏 준비하여 가족과 같은 마음으로 고객 한분 한분의 형편과 필요에 맞게 최상의 선택을 하실수 있도록 도와드리고 있습니다. 항상 노력하고 늘 발전하는 아주자동차가 되겠습니다. 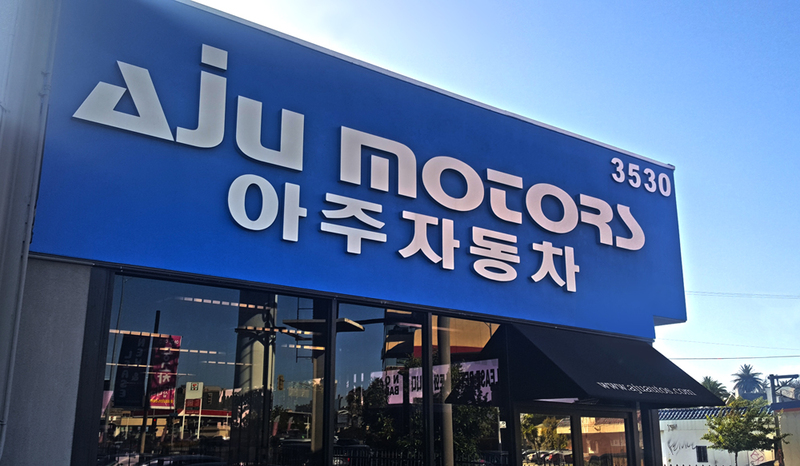 AJU Motors has been providing high quality vehicles to drivers throughout Los Angeles and beyond for over 20 years, and we’re proud to see so many of them come back to our dealership again and again. That’s because when you shop for a pre-owned vehicle at AJU Motors, you’ll never have to compromise. We’ve got low prices on all our models, and each one is sure to last you for years to come. Whether you’re looking for a large SUV or minivan to tote your whole family around, a reliable sedan to get you to and from work comfortably and safely, or a sports coupe to add some spice to your life, you’ll find it at AJU Motors. You’ll also be able to take advantage of our competitive APR rates through our financing department! We continue our commitment to our customers long after they buy an affordable vehicle from us. at 3530 W Olympic Blvd. Los Angeles, CA.